The tale of Tír Na nÓg - the land of eternal youth. One of the world's most famous Irish legends, the tale of Tír Na nÓg, a paradise and supernatural realm of everlasting youth, beauty, health, abundance, and joy. 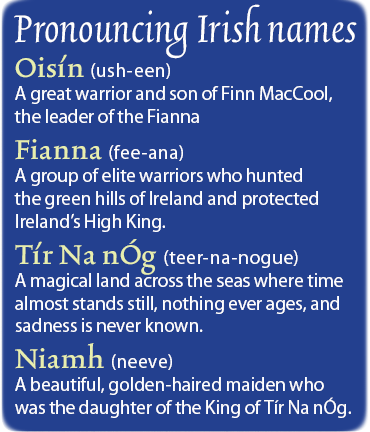 Once upon a time, many years ago, there lived a great warrior named Oisín, son of legendary Fionn Mac Cumhaill, or Finn MacCool in its English form. MacCool was the leader of Fianna – a group of great protectors who guarded High King of Ireland – and each day Oisín and Fianna explored beautiful green hills of Ireland as they hunted the land. One day, Oisín and Fianna saw a beautiful white horse in distance, and on its back was the most beautiful young woman they had ever seen. Her hair was color of the sun, and fell to her waist, and she wore a dress of palest blue studded with stars. She was surrounded by a golden light. "As beautiful woman and her horse drew nearer..."
Oisín immediately fell in love with Niamh, and although he was sad to be leaving his father and Fianna, he agreed to join Niamh on horseback to go and live in Tír Na nÓg, promising Finn MacCool that he would return to Ireland to see him again soon. The fine white horse galloped across silver seas into the magical land of Tír Na nÓg. As Niamh had promised, this was a land where nobody knew of sadness, and where nobody ever aged, everyone there lived forever. Together, Niamh and Oisín spent many happy times together, although there was a small part of Oisín’s heart that was lonely. He missed his homeland of Ireland and longed to see his father and Fianna again. Oisín set off across seas on Niamh’s white horse and arrived in Ireland. When he got there, he could see that things had changed. The Fianna no longer hunted green hills, and grand castle that once housed his family was crumbling and covered in ivy.As he was searching for someone familiar in green hills, Oisín came across some old men, who were having difficulty trying to move a huge rock. He leaned down from his horse to help them, but in doing so he lost his balance and fell from the horse. The moment Oisín touched Irish soil, he immediately aged 300 years that he had missed in Ireland. "An old, frail man, he asked men he had stopped to help about his father Finn MacCool..."
An old, frail man, he asked men he had stopped to help about his father Finn MacCool, and they told him that Finn had died many years before. Broken-hearted and many hundred years old, Oisín died soon after, but not before he shared legends and stories of Fianna, his father great Finn MacCool and magical land of eternal youth that is Tír Na nÓg. And even today in Ireland, these legends live on.